READ THE FOLLOWING TERMS AND CONDITIONS CAREFULLY BEFORE INSTALLING. BY INSTALLING THE SOFTWARE YOU AGREE TO BE BOUND BY THE TERMS AND CONDITIONS SET FORTH HEREIN. IF YOU DO NOT AGREE TO BE BOUND BY THE TERMS AND CONDITIONS THEN DO NOT INSTALL OR USE THIS SOFTWARE IN ANY WAY, SHAPE OR FORM. (a) use this Software during the term of this Agreement on two machines. (b) use the documentation during the term of this Agreement in support of your use of the Software. (a) make or have made any copies of the Software, documentation, or any portion thereof, except one copy solely for backup purposes. (b) copy the Software or documentation, except to the extent permitted by paragraph 2(a), or allow any other party to do so. (c) sublicense, distribute, disclose or transfer any copy of this Software or the documentation in whole or in part, to any third party, or allow any other party to do so. (d) use the Software simultaneously on more that two machines, or allow any other party to do so. (e) use the Software, documentation or any portion thereof after any expiration, termination or cancellation of this agreement or any license granted hereunder, or allow any other party to do so. (f) modify, adapt, translate, decompile, reverse engineer, disassemble or otherwise derive a source code for the Software, or allow any other party to do so. (g) alter, change or remove any proprietary notices or confidentiality legends placed on or contained in the Software, or allow any other party to do so. (h) use the trademarks contained on or in the Software except as in accordance with accepted trademark practice. (a) THIS SOFTWARE IS WARRANTIED FOR A PERIOD OF THIRTY (30) DAYS AFTER YOUR RECEIPT OF THE SOFTWARE, TO BE FREE FROM DEFECT IN MATERIAL AND WORKMANSHIP. YOUR SOLE AND EXCLUSIVE REMEDY, AND METTLE COMMUNICATIONS INC.'S SOLE LIABILITY SHALL BE THAT METTLE COMMUNICATIONS INC. WILL REPLACE THE COMPACT DISC(S) OR OTHER MEDIA NOT MEETING METTLE COMMUNICATIONS INC.'S LIMITED WARRANTY. YOU MUST REPORT ALL DEFECTS AND RETURN THE SOFTWARE TO METTLE COMMUNICATIONS INC. WITHIN THIRTY DAYS OF THE DATE YOU RECEIVED THE SOFTWARE. (b) EXCEPT AND TO THE EXTENT EXPRESSLY PROVIDED IN PARAGRAPH 3(a) THE SOFTWARE AND DOCUMENTATION ARE PROVIDED ON AN "AS IS" BASIS, WITHOUT ANY WARRANTIES OF ANY KIND, INCLUDING, BUT NOT LIMITED TO, ANY IMPLIED WARRANTIES OF MERCHANTABILITY OR FITNESS FOR A PARTICULAR PURPOSE. YOU ASSUME THE ENTIRE LIABILITY FOR THE SELECTION AND USE FOR THE SOFTWARE AND DOCUMENTATION, AND METTLE COMMUNICATIONS INC. SHALL HAVE NO LIABILITIES FOR ANY ERRORS, MALFUNCTIONS, DEFECTS OR LOSS OF DATA FROM OR RELATING TO THE USE OF THE SOFTWARE AND/OR DOCUMENTATION. (c) METTLE COMMUNICATIONS INC. SHALL NOT BE LIABLE TO YOU FOR ANY INDIRECT, SPECIAL OR CONSEQUENTIAL DAMAGES OR LOST PROFITS ARISING OUT OF OR RELATED TO THIS AGREEMENT OR YOUR USE OF THE SOFTWARE AND/OR DOCUMENTATION, EVEN IF METTLE COMMUNICATIONS INC. HAS BEEN ADVISED OF THE POSSIBILITY OF SUCH DAMAGES. IN NO EVENT SHALL METTLE COMMUNICATIONS INC.'S LIABILITY HEREUNDER, IF ANY, EXCEED THE PURCHASE PRICE PAID BY YOU FOR THE SOFTWARE AND DOCUMENTATION. 4. Commencement of Agreement. The term of this Agreement and the license granted to you pursuant to paragraph 1 shall commence upon your opening of this package and shall terminate upon your discontinuing the use of the Software. 5. Termination and Cancellation. This Agreement and the License granted herein may be terminated and/or canceled by METTLE COMMUNICATIONS INC. in the event you are in breach of any provision of this Agreement. (a) This Agreement is the complete agreement and understanding of the parties with respect to the Software and documentation and supersedes all prior oral, written and other representations and agreements. This Agreement may only be amended by the express written consent of METTLE COMMUNICATIONS INC., and METTLE COMMUNICATIONS INC. disclaims any and all warranties or representations made by any other party other that METTLE COMMUNICATIONS INC. and which are not contained in this agreement. (b) Title in and to the Software and documentation remains exclusively in METTLE COMMUNICATIONS INC., subject to express, limited and non-exclusive license granted to you pursuant to paragraph 1. (c) The Software contains proprietary information which METTLE COMMUNICATIONS INC. considers trade secrets and confidential proprietary to METTLE COMMUNICATIONS INC. You shall not use, disclose, nor permit any person to obtain such proprietary information, except to the extent such information is necessary for the normal use of the Software. (e) If any provision of this license is determined to be invalid or unenforceable that provision shall be deemed severed from the remainder of this license and the remaining provision of this license shall remain in full force and effect. BY INSTALLING THIS SOFTWARE YOU ACKNOWLEDGE THAT YOU HAVE READ AND UNDERSTAND THE FOREGOING AND THAT YOU AGREE TO BE BOUND THEREBY. 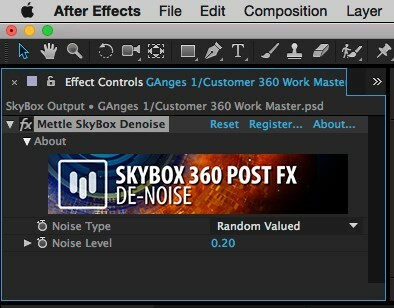 Mettle Skybox Suite of plugins will be exclusively available as part of the Creative Cloud membership. Adobe is targeting to release the integrated functionality before the end of the year. You can expect to hear and see lots of exciting news before the end of the year. 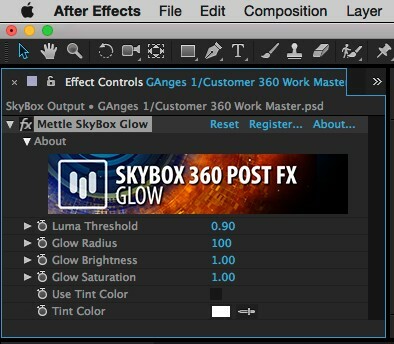 SkyBox 360 Post FX is a set of seamless post effects for cinematic 360|VR Production in After Effects. They can be applied to stitched 360° footage with no distortion along the seams. 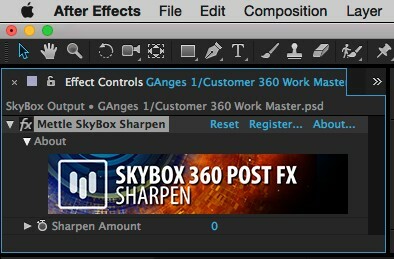 Apply SkyBox Post FX directly on imported 360° footage, or on an Adjustment layer. We currently support Equirectangular format, either mono 2:1 or Stereo 1:1 over-under. 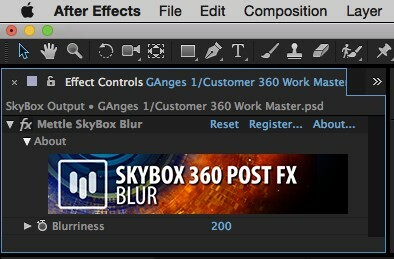 SkyBox 360 Post FX complement our other 360/VR plugins for Adobe After Effects: SkyBox and SkyBox Studio and our free SkyBox VR Player. Adjusts relative sharpen amount between 0 and 100 (max). Choose noise type to suppress: Random Valued or Salt-and-Pepper (black and/or white speckles). Adjust hypothetical input noise level until best output result is found. Defines image region that will glow, i.e. regions where luma (brightness) is more than a threshold, between 0.0 (black) and 1.0 (white). Defines radius of glowing halo, in pixels. Multiplier for glow brightness intensity, default is 1.0. Multiplier for glow saturation (color) intensity, default is 1.0. Choose tint color, which has effect only when Use Tint Color is checked. * Licensing issues fixed (watermark in AME). * Potential licensing issues fixed. * Fix for HDR support. * Layer scaling support in AE fixed. * New param added: “Frame Layout”. Save 45% on Plugin Everything's 'Everything' Bundle, featuring bestsellers and out latest & greatest. Allows you to get the look of LCD (or you may see like CRT) like effect in 1-click. A quick way to animate "write-on" reveal mattes in After Effects. Fixel Detailizer 2 AE decomposes the image into 5 different details scales to allow a complete control of the contrast level of each detail scale level. Controlling and enhancing the details and contrast level at each scale is just as easy as using Hi-Fi Equalizer. Detailizer is fast effective and simple to use. Special Fixel Detailizer 2 Bundle (Photoshop + After Effects) price. Owners of previous versions of Fixel Detailizer are entitled to 50% discount. Fixel EdgeHancer features a novel algorithm to enhance and emphasize edges in images. Unlike "classic" sharpeners, EdgeHancer emphasizes the edges exclusively instead of increasing the contrast of the surrounding pixels. EdgeHancer is fast effective and simple to use. Special Fixel EdgeHancer 2 Bundle (Photoshop + After Effects + Premiere Pro) price. 3D Volumetric Fractal Flames. Create beautiful backgrounds, Nebulas and sci-fi fx, in traditional and 360/VR formats. Transform your footage into surreal and fantastic animations. After Effects and Premiere Pro.